The Big Brother 13 house guests participated in the weekly food competition. Shelly, Cassi, Dominick and Adam were selected by the winners to be have not’s for the week. 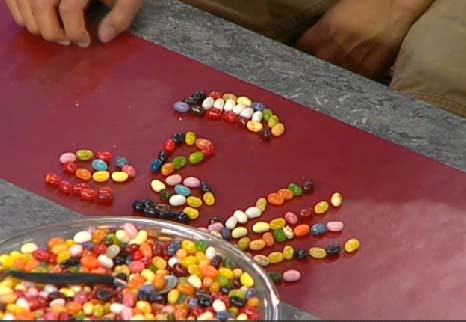 So the entire week, they will be limited to the 2 items (jerky & jellybeans) the condiments on the official Big Brother list, and Slop. Jellybeans can be used for so much more than smileys! Here are my suggestions for this week. The Jellybeans are wonderful for this week, because they are beans. Jelly Belly’s come in 50 different flavors, including buttered popcorn, green chile, chili mango, and even cappuccino flavored beans. These jellybeans could be melted down with water and sugar to form simple syrups to add flavors to slop pancakes, water, ice (sno cones and Hawaiian shave ice, and even the protein drinks to add flavor. Jerky was also a very generous gift, and they have many flavors to work with. 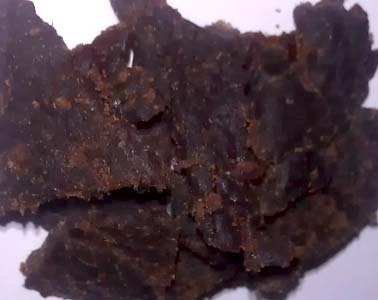 Jerky is normally very salty and I think that soaking it to re-hydrate it is the best way to get the flavor and salt out of the meat and get it prepared for other applications. In a frying pan heat 1/4 cup of Chili mango jelly beans in a 3 tablespoons of water tablespoons of water until melted and water begins to evaporate. Add re-hydrated beef jerky and coat with chili mango sauce. Add 1 cup salsa and continue to heat. Add spices and salt and pepper to suit your tastes. Serve hot and enjoy! In a fry pan, create a simple syrup by melting jelly beans and water together. Keep stirring until jelly beans have melted, then remove from heat, but keep warm! In a small bowl, combine processed slop and spices. Coat the re-hydrated beef jerky in the slop/spice mixture. Fry coated beef in olive oil or vegetable oil until crispy. Pour sauce over crispy beef, mix and eat! When your making something from nothing, make it good!! !